Corey Cushing on SJR Diamond Mist scores 223 reining and 222.5 fence to win the Ft. Worth 2018 NRCHA Open Futurity Championship! 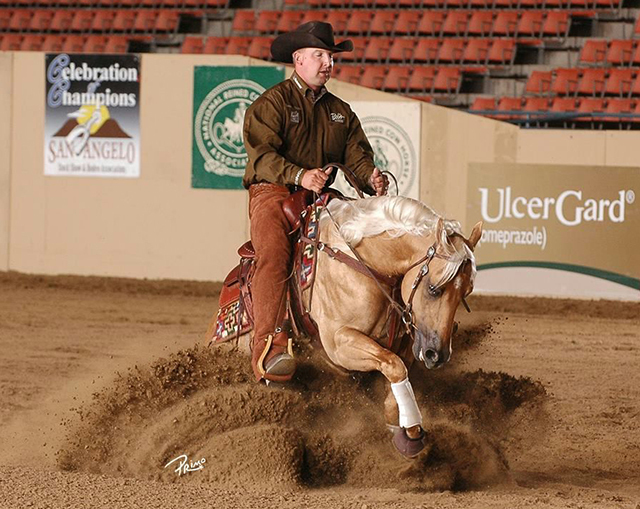 SJR Diamond Mist is bred and owned by San Juan Ranch and is by CD Diamond, also a San Juan Ranch bred and owned stallion and the 2012 NRCHA Open Futurity Champion. San Juan Ranch, the 2016 Equi-Stat #2 NRCHA Breeder of the Year, announces the CD Diamond Incentive Fund. 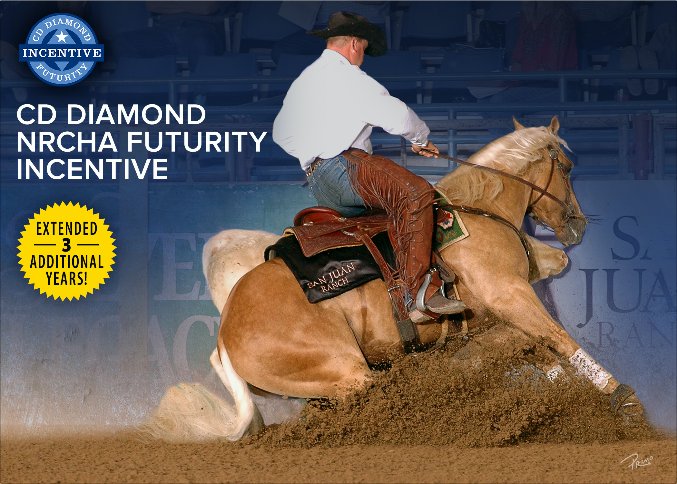 Top placing CD Diamond foals in 2018 through 2023 NRCHA Ft. Worth Futurity Finals will receive $25,000 (Open); $10,000 (Non-Pro). San Juan Ranch has been ranked #4 Equi-Stat Reined Cow Horse Breeder, All Ages / All Divisions for 2018! 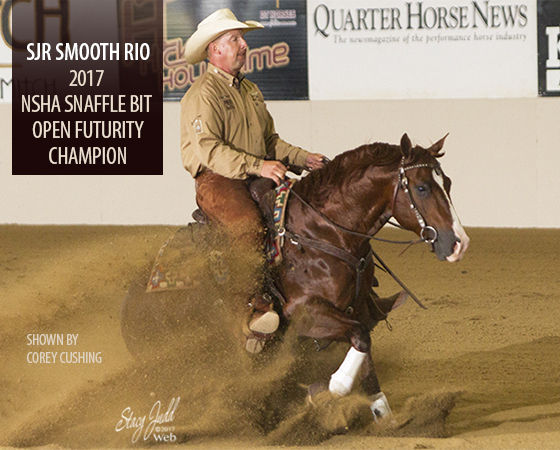 Congratulations to San Juan Ranch bred SJR All Time Cash and Lyle Proctor - Non Pro Two Rein Champions at the Reno Snaffle Bit Futurity! SJR All Time Cash is out of our mare Shesa Lota Cash and by One Time Pepto. We will have a half sibling to SJR All Time Cash (by CD Diamond) available at the NRCHA Snaffle Bit Futurity Sale! Congratulations to Brady Weaver and San Juan Ranch bred SJR Reygun - 2018 NSHA Futurity Show Open Two Rein Champions! The pair marked a 220 on the fence! SJR Reygun is by Dual Rey out of the SJR mare Playguns King Badger (by Playgun). We will have a half sibling to SJR Reygun (by CD Diamond), SJR Diamond King, for sale at the NRCHA Futurity Sale! View Sale Horses from 10:00 a.m. to 4:00 p.m.
BBQ Lunch from 11:00 a.m. to 2:00 p.m.
Congratulations to SJR Smooth Rio on being the 15th NRCHA Leading Money Earner for 2017! 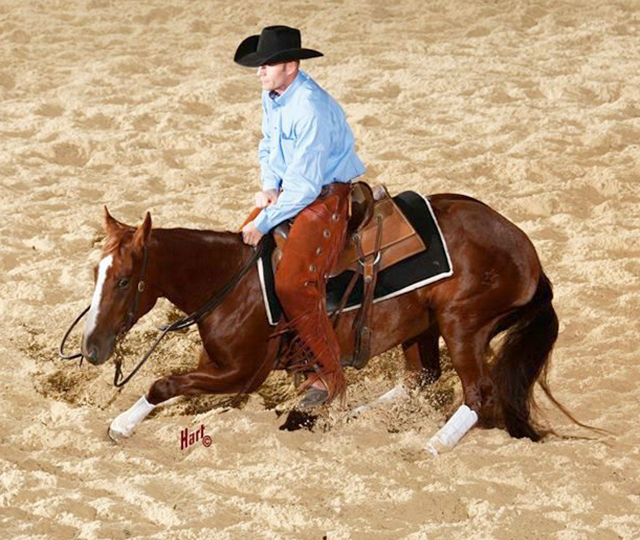 Bred and owned by San Juan Ranch, SJR Smooth Rio is by Smooth As A Cat out of SJR’s mare Shiners Diamond Girl. 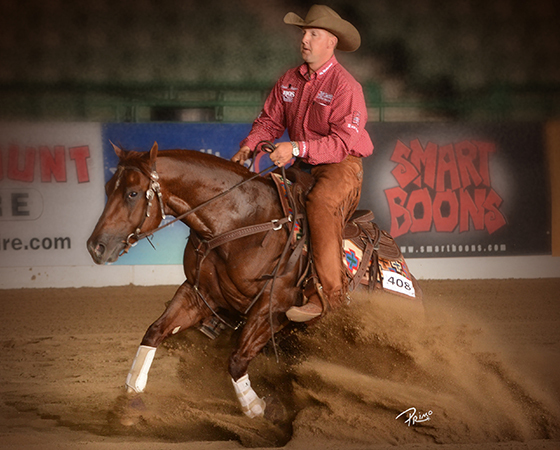 Next stop for SJR Smooth Rio and Corey Cushing is the National Reined Cow Horse Association Stakes in Las Vegas! Congratulations to Brady Weaver and San Juan Ranch bred SJR Reygun - 2018 NRCHA Open Hackamore World Championships TOP FIVE! SJR Reygun is by Dual Rey out of the SJR mare Playguns King Badger (by Playgun). SJR Stylish Marilyn and Tucker Robinson place TOP TEN in the NRCHA Cow Horse Classic Open Derby! She also tied for third in the cow work with a 148! 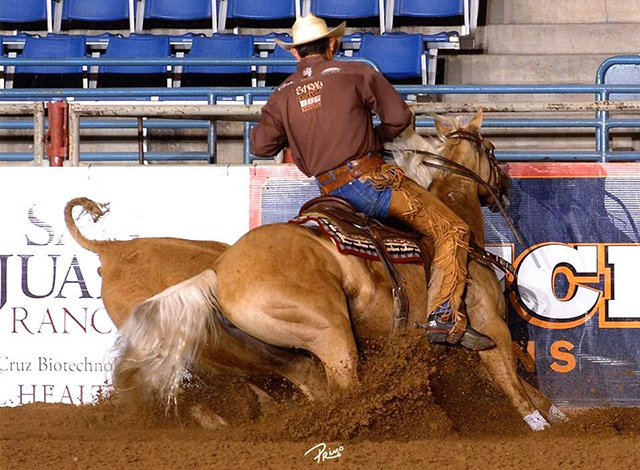 Bred by San Juan Ranch, the 2013 mare is by One Time Pepto out of NRCHA Open Futurity Champion Stylish Little Oak! She currently has earnings of over $16,000! 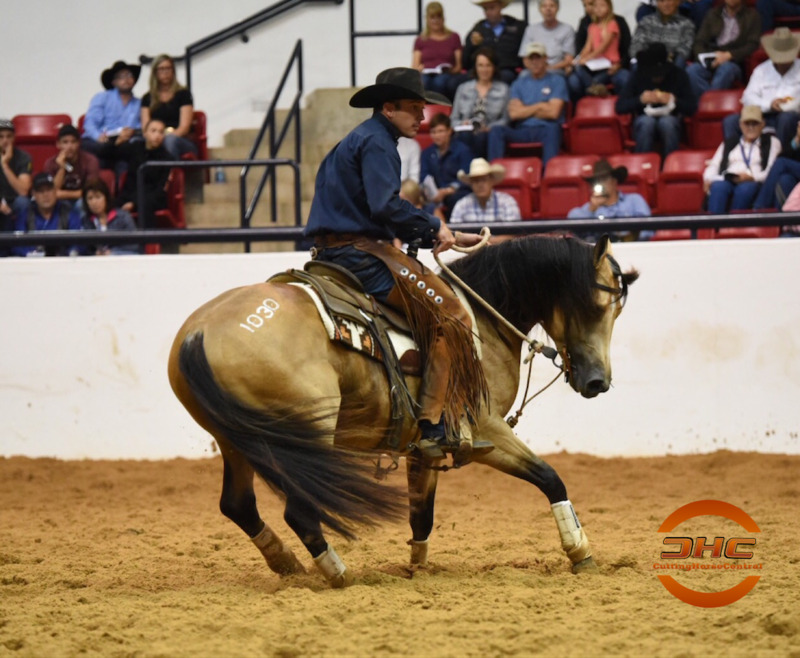 San Juan Ranch bred Shiine is High Selling 2 Year Old at the 2017 NRCHA Snaffle Bit Futurity Sale! 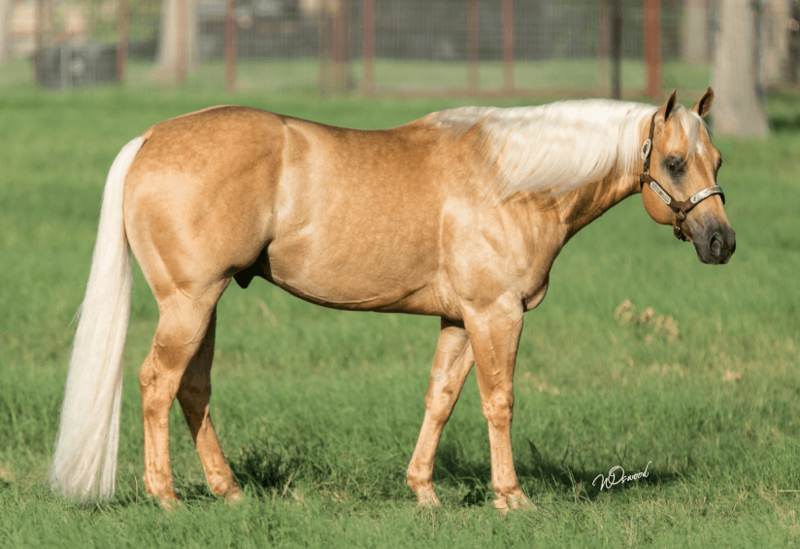 Shiine, 2015 Buckskin Colt by One Time Pepto and out of San Juan Ranch Mare Shiners Eva by Shining Spark, was purchased by Alison Benele for $90,000. SJR Smooth Rio, ridden by Corey Cushing, wins the NSHA Snaffle Bit Open Futurity in Paso Robles, CA! 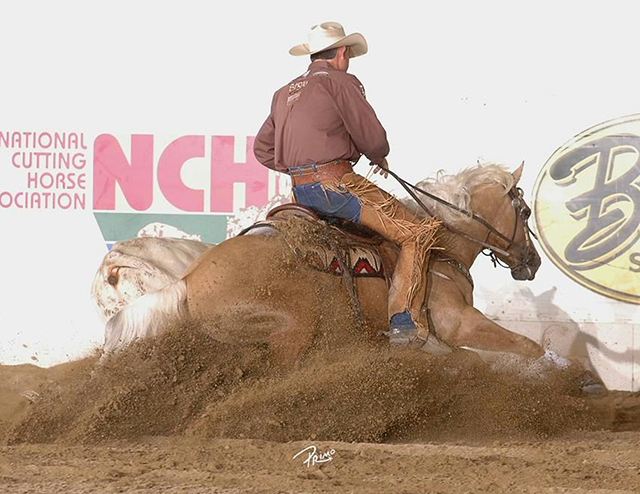 SJR Smooth Rio (Smooth As A Cat x Shiners Diamond Girl) is bred and owned by San Juan Ranch. Shiners Diamond Girl is also the Dam of both CD Diamond, 2012 NRCHA Open Futurity Champion, and SJR Diamond Rey, 2016 NRCHA Open Stakes Champion. San Juan Ranch is now an NRCHA Million Dollar Breeder! 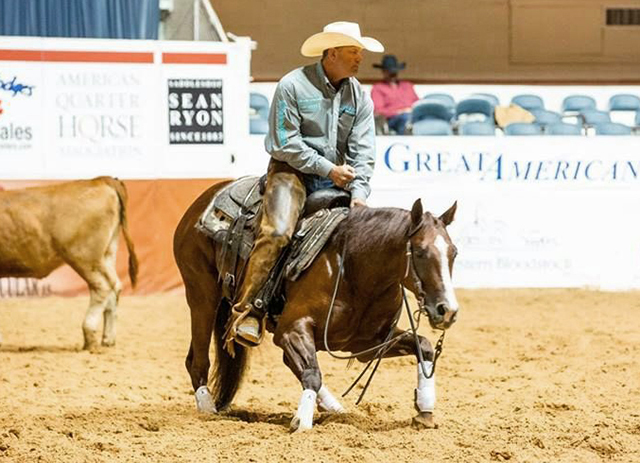 With NRCHA Open Futurity Champion and 2012 NRCHA Horse of the Year, CD Diamond, leading the way, San Juan Ranch has reached an elite status few breeders achieve. 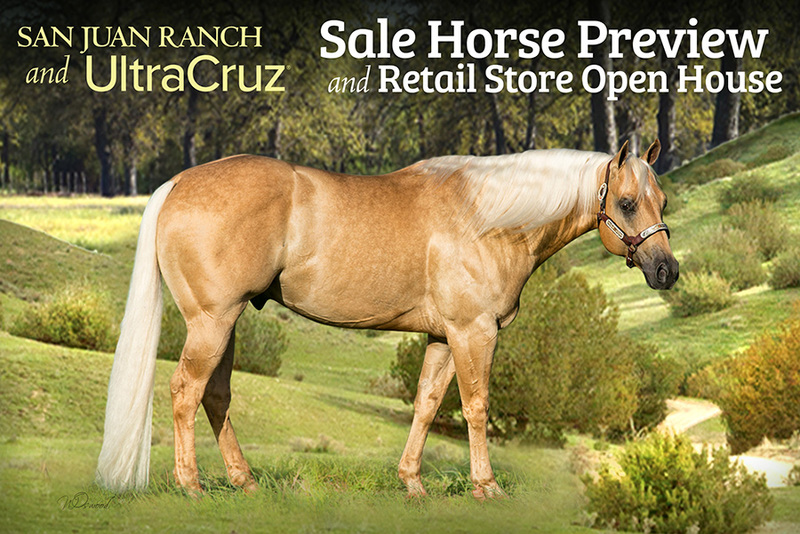 San Juan Ranch has achieved this status in only 10 years to become one of few breeders to hit this milestone. 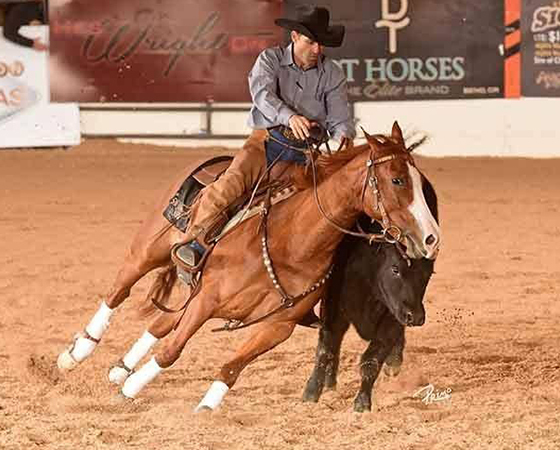 San Juan Ranch breeding program produces second NRCHA Stakes Open Champion in 2 years with Brady Weaver on SJR Reygun winning the Open and Intermediate Open Championships Saturday night in Las Vegas, marking an unheard of 230 fence score (see historic ride: https://youtu.be/YJAre8I13Gs). 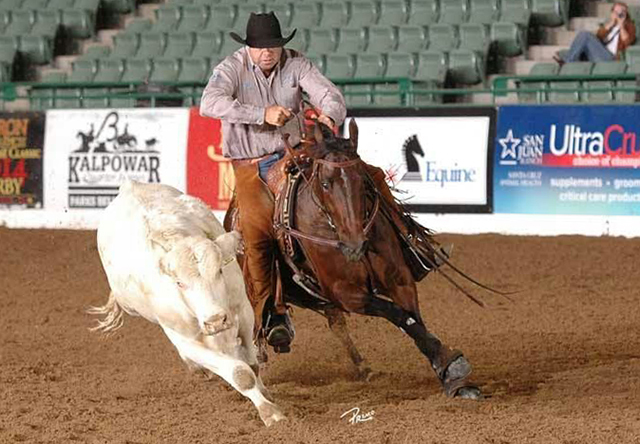 Last year the Stakes Open Championship went to Corey Cushing on SJR Diamond Rey, bred and owned by San Juan Ranch. 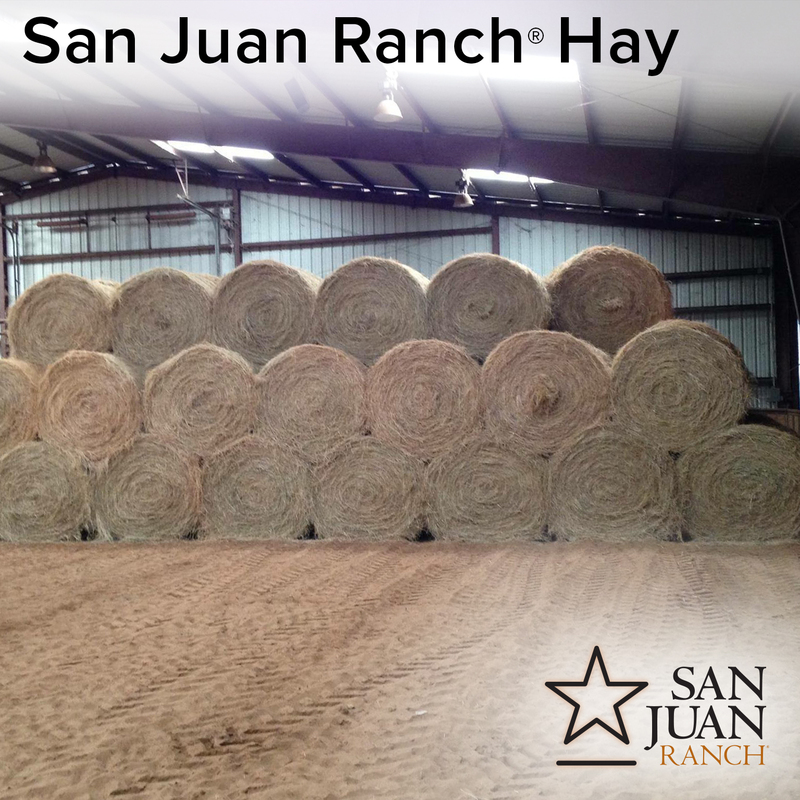 Alfalfa hay available for sale from San Juan Ranch. Contact our Weatherford ranch at 940-682-2205 for more information. 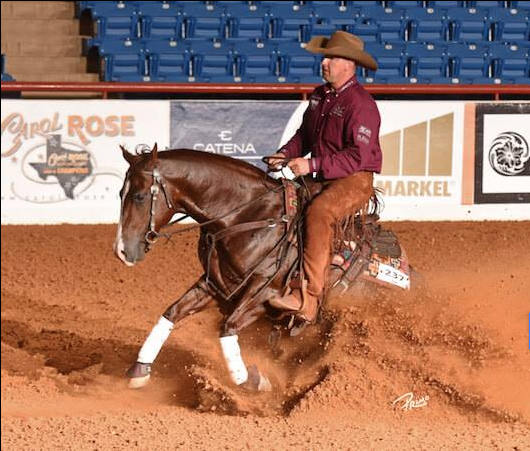 The Reyl McCoy, shown by Tate Bennett, by Dual Rey and out of San Juan Ranch’s mare, Cool the Engines (by Smart Little Lena with PE over $300,000) placed 4th in the NCHA Open Super Stakes Finals. 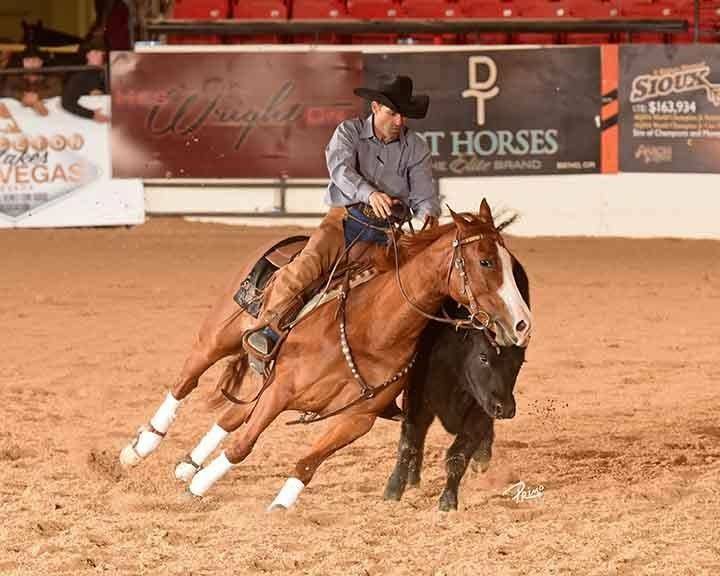 SJR Smooth Gina, bred and owned by San Juan Ranch and ridden by Boyd Rice, qualifies for the Semi-Finals at the NCHA Super Stakes in Ft. Worth, Texas! Congratulations Boyd! 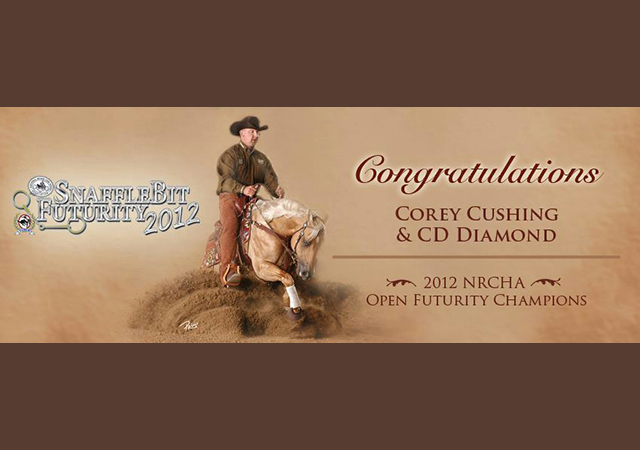 SJR Diamond Rey, ridden by Corey Cushing, wins the NRCHA Stakes Open Championship with a composite score of 665.5! Congratulations Corey! SJR Diamond Rey is out of Shiners Diamond Girl, dam of CD Diamond, 2012 NRCHA Open Futurity Champion. Boyd Rice, riding San Juan’s Renegade Rey, qualifies for the Finals at the Cattleman’s Classic in Graham, TX with a 437.5 composite score! Open finals are March 9. 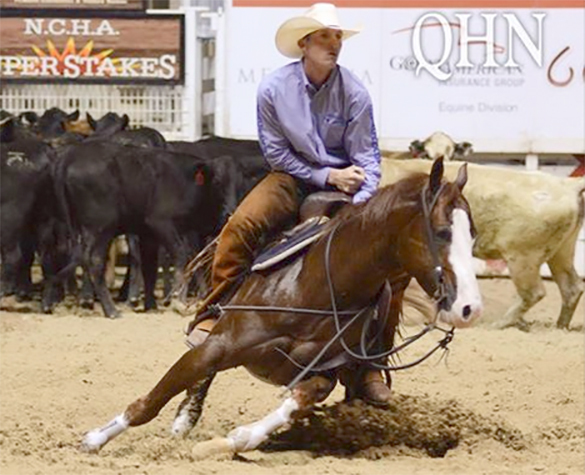 Clayton Edsall on Skeets Oak Peppy, out of San Juan Ranch’s great mare, Oak Ill Be, is competing in the Finals at the 2016 NRCHA World’s Greatest Horseman! Good luck Clayton! Congratulations Cullen Chartier riding Scooter McGavin on winning the NCHA Open in Augusta with a great 223.5 score! 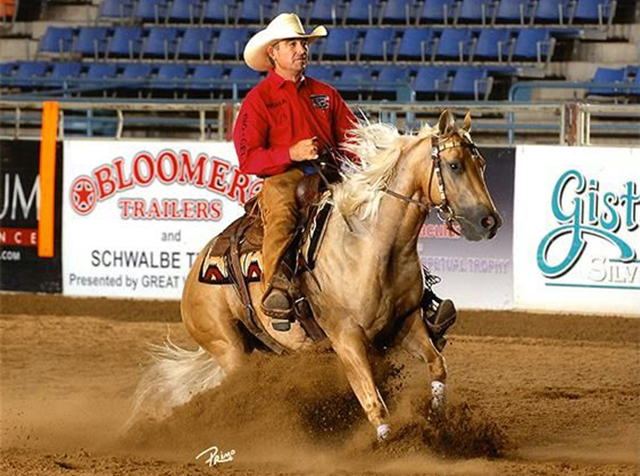 Scooter McGavin, owned by Hillary Watson, is by Smart Lil Scoot and out of San Juan Ranch’s great mare Natalie Rey, LTE: $51,760, PE: $106,696. FINALS! SJR Smooth Gina, bred and owned by San Juan Ranch and ridden by Boyd Rice, advances to the Finals at the NCHA Cutting Open Futurity in Ft. Worth, Texas! Congratulations Boyd! Semifinals! 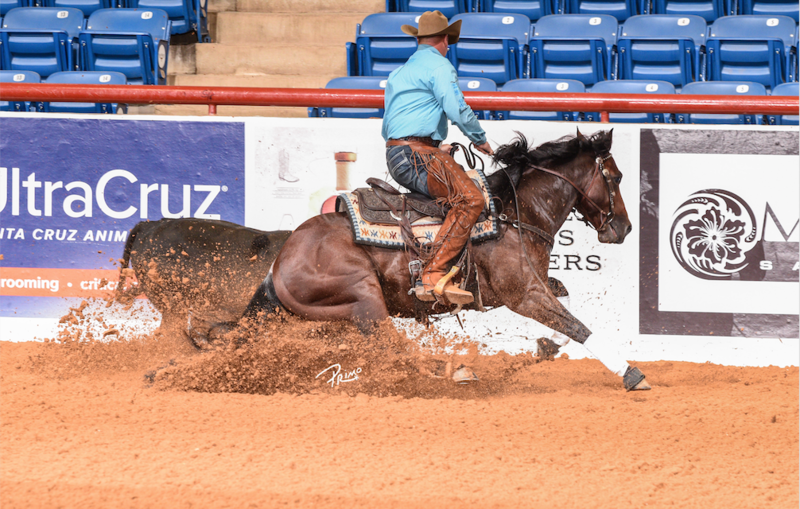 SJR Smooth Gina, bred and owned by San Juan Ranch and ridden by Boyd Rice, makes the semifinals at the NCHA Cutting Open Futurity in Ft. Worth, Texas. Congratulations Boyd! Congratulations to Slithering Spoon, 2014 PCCHA Open Futurity, Reserve Champion! Slithering Spoon is out of the great San Juan Ranch mare, Sues Barn Cat, and by He’s a Peptospoonful. Slithering Spoon is owned by David and Stacie McDavid, and shown by Clint Allen. CD Sparkle makes 2015 Open Two Rein Top 5. 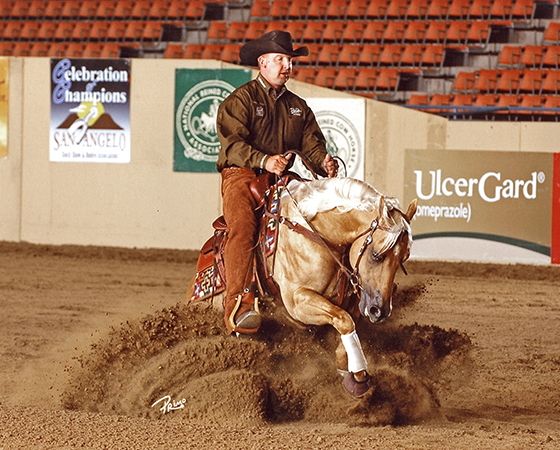 Bred and owned by San Juan Ranch and ridden by Jake Gorrell. 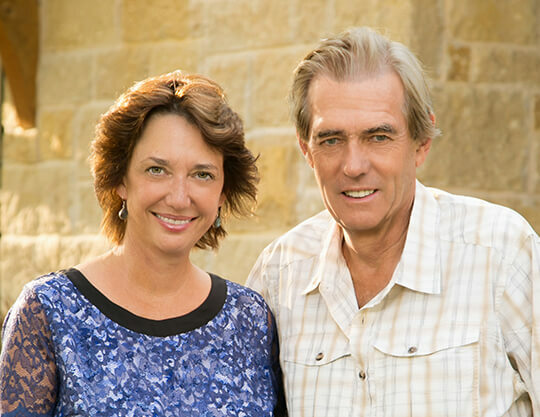 The newest members of the NRCHA Hall of Merit are John and Brenda Stephenson of San Juan Ranch, a division of Santa Cruz Biotechnologies. Located in the heart of reined cow horse country, in eastern San Luis Obispo County, California, San Juan Ranch specializes in the production of Gelbvieh beef cattle and world-class performance horses. The Stephensons have twice celebrated a milestone many NRCHA breeder-owners only dream of: watching horses they raised win the Snaffle Bit Futurity Open Championship. 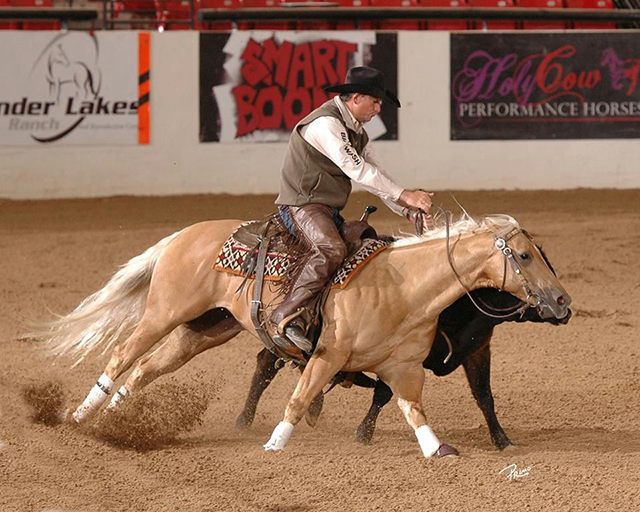 The first San Juan Ranch horse to claim the coveted title was Stylish Little Oak (Playin Stylish x Shiners Little Oak x Shining Spark), who won the 2010 Snaffle Bit Futurity Open with Tucker Robinson in the saddle. 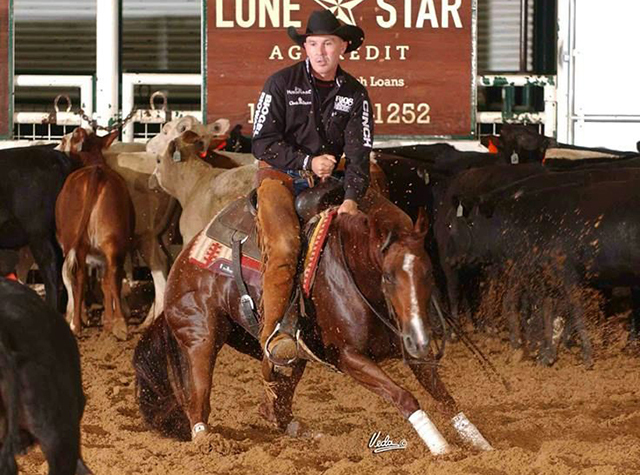 The Stephensons did not have to wait long for a repeat: in 2012, CD Diamond (CD Olena x Shiners Diamond Girl x Shining Spark), with NRCHA Million Dollar Rider Corey Cushing aboard, made them proud once again with a Futurity Open Championship. 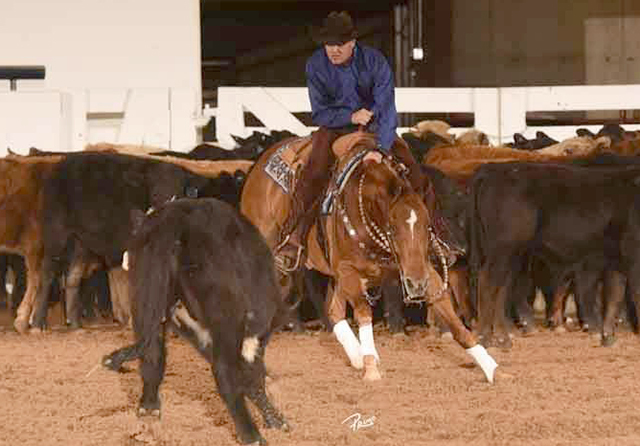 The Stephensons are steadfast supporters of the National Reined Cow Horse Association; San Juan Ranch is a Breeder Sponsor and a Corporate Partner. The Ranch also sponsors the traditional early-bird breakfast on finals day at the NRCHA Derby in Paso Robles, California, every year. "Our hearts are in the working cow horse. We love the working cow horse events. Our breeding program is focused on that," Brenda Stephenson said, after Stylish Little Oak won the 2010 Snaffle Bit Futurity. CD Sparkle places 5th in the Jr. Working Cowhorse World Show Finals! 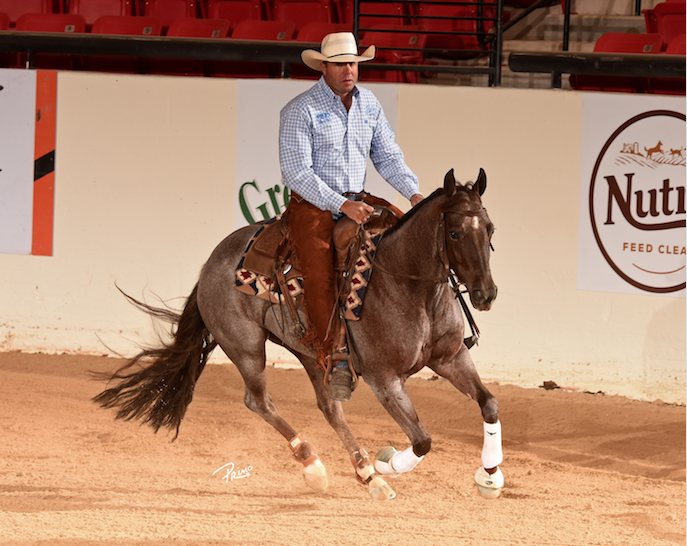 Bred, Owned, and Shown by the San Juan Ranch with Jake Gorrell. CD Sparkle makes the Jr. Working CowHorse World Show Finals! 222.5 on the fence work! 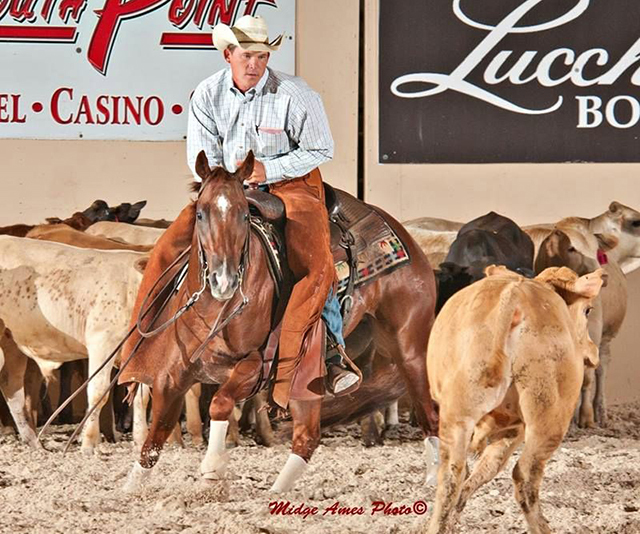 Bred, Owned and Shown by the San Juan Ranch with Jake Gorrell. Oaks Avita, bred and owned by San Juan Ranch and ridden by Tucker Robinson, scores a 223 on the fence in the NRCHA Preliminaries to qualify for both the Intermediate and Open finals! 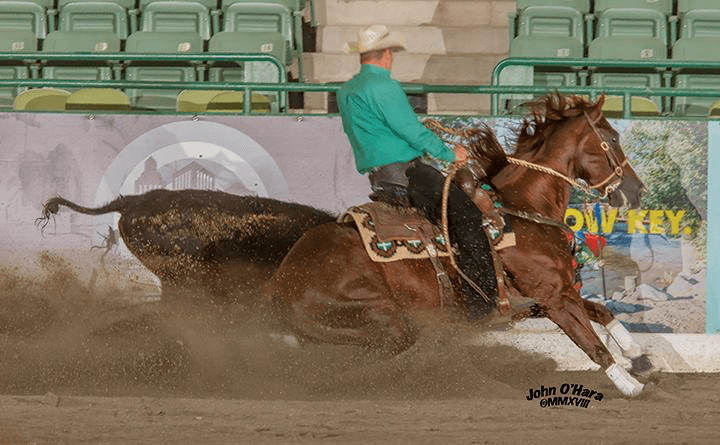 Metallic 007, bred and raised by the San Juan Ranch, is the 2014 El Rancho Futurity Open Reserve Champion and Open Gelding Champion with a score of 222! Congratulations Steve Schlesinger! 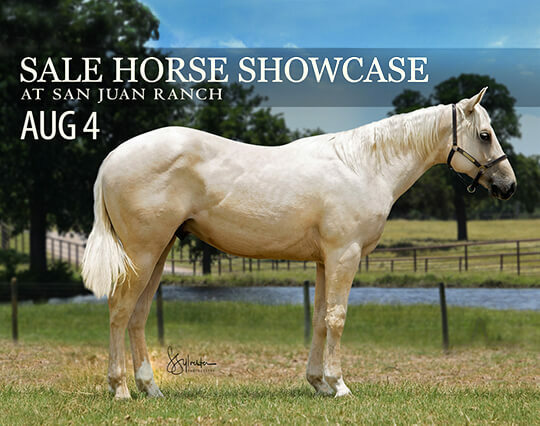 Metallic 007 is out of San Juan Ranch’s great mare Missin Bunny, producer of over $155,514. 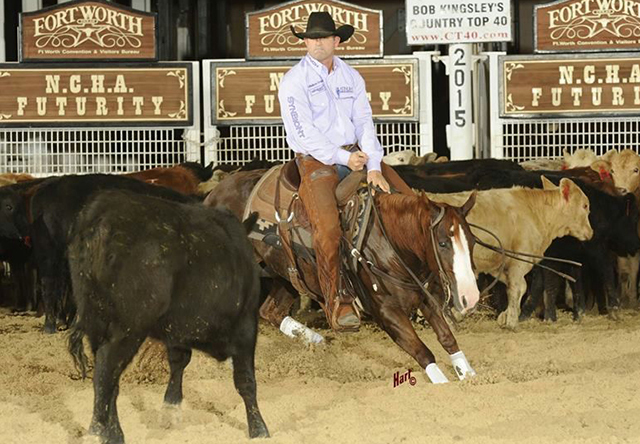 Ginas Rey, shown by Chris Johnsrud, marks a 436 combined score in the first and second qualifying rounds of the NCHA Open Derby at Ft. Worth to advance to the SemiFinals! Ginas Rey, out of San Juan Ranch’s great mare Gina Badger (producer of over $300,000), was bred and raised by the San Juan Ranch. 225 Open Cow Work Champion at the NRCHA Open Stakes in Las Vegas! Congratulations Jake Gorrell on San Juan’s CD Sparkle, half sister to CD Diamond, 2012 NRCHA Open Futurity Champion. See video at this link. Ginas Rey makes the FINALS in the NCHA Open 4YR Bonanza Finals. Shown by Chris Johnsrud. 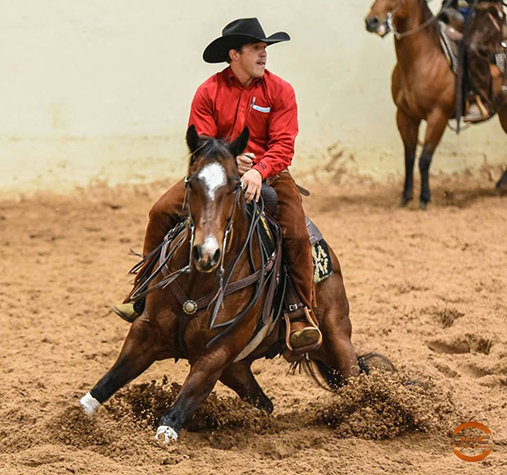 Ginas Rey was bred and raised by San Juan Ranch on UltraCruz supplements and is out of San Juan Ranch’s great mare Gina Badger (producer of over $250,000) and sired by world class stallion Dual Rey. Ginas Rey is currently owned by Don Hudson. After a busy spring at the breeding barn, CD Diamond takes some time out to qualify for finals at the NRCHA Derby scoring 216 Herd, 220.5 Reining and 219.5 on the Fence! Congratulations Corey Cushing! 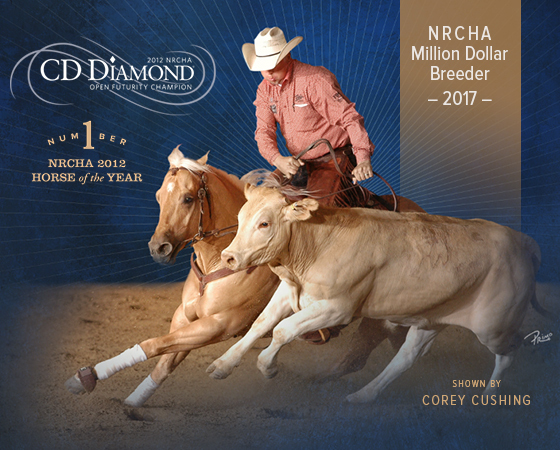 CD Diamond, bred and owned by the San Juan Ranch is the #1 NRCHA Horse of the Year for All Ages / All Divisions, the #1 NRCHA 3 Year Old Open Horse of the Year, and he is shown by Corey Cushing, #1 Open Rider of the Year! CD Diamond wins the Open Futurity at the 2012 Snaffle Bit Futurity in Reno. Congratulations CD Diamond and Corey Cushing! 2013 NRCHA Celebration of Champions Open Derby: CD Sparkle; 10th, Cow Work Go 3rd, score of 148.5. Novice Reserve Champion. Shown by Jake Gorrell. Congratulations to CD Sparkle, bred, owned and raised by the San Juan Ranch: 2013 NRCHA Celebration of Champions Open Derby 10th Place! Cow Work Go 3rd, score of 148.5. Novice Reserve Champion! Shown by Jake Gorrell.